See also: Granville Grant and District; Sugar Creek, War of. 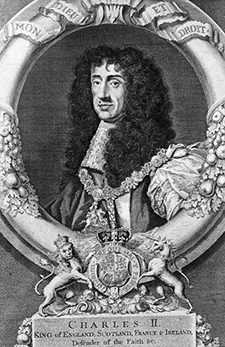 Land Grants, or gifts of land to individuals in perpetuity, were instrumental in the growth and development of North Carolina beginning in 1663 with the granting of the first Carolina charter by King Charles II. That charter endowed a great theoretical swath of land from the neighborhood of St. Augustine, Florida, to what became the Virginia line, and westward from the Atlantic Ocean-disregarding French and Spanish claims and the homelands of indigenous nations-all the way to the South Seas (Pacific Ocean). The grantees, the eight Lords Proprietors who had helped restore the Stuarts to the throne of England, shared equal control over the land but were generally ineffectual speculators. Vertue, George "Engraving, Accession #: S.HSHB.1964.58.1." 1736. North Carolina Historic Sites. 1 January 2006 | Southern, David; Towles, Louis P.